Hello friends!! Hope you all had a great holiday weekend! Today, I have a layout to share with you, using up some more of my stash. 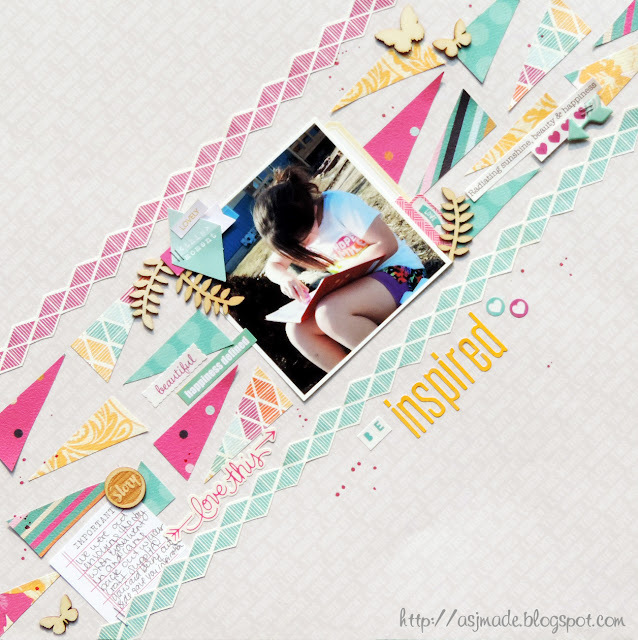 I had an idea with this layout to do it all on the diagonal. I have seen a few layouts here and there lately using this style, and I thought it would be something fun and different to try out! This is an older picture of our oldest daughter. We were all outside one day, just sitting and playing, enjoying the beautiful day...when she all of the sudden runs inside, and comes back out with her journal and some other scrappy supplies. She plops down beside me and gets busy..I ask her what she is doing, and she says, being outside gives her inspiration..so she wanted to scrapbook. Of course, I had to document this moment! 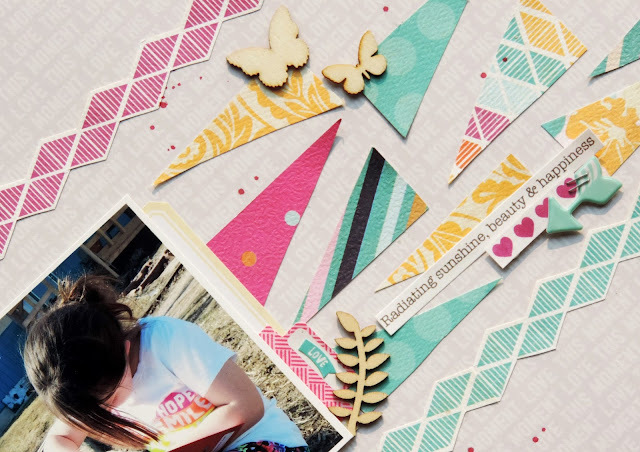 I wanted to use some fun and colorful pattern on this since her clothes were so colorful..they aren't exact matches, but I really thing that the tones work well together, and it makes the photo pop...I didn't want the patterns to overwhelm the page though, so I cut some triangles, and just went through and placed them in a way pleasing to my eye. Then I wanted some type of border, so I grabbed one of the papers I had used for the triangles, and fussy cut out the full strips to have my top and bottom border. Then, I just began to fill in spots with embellishment. I tried to stick to the color scheme, and also added in some wooden elements to go with the outdoors type of photo, and meaning. 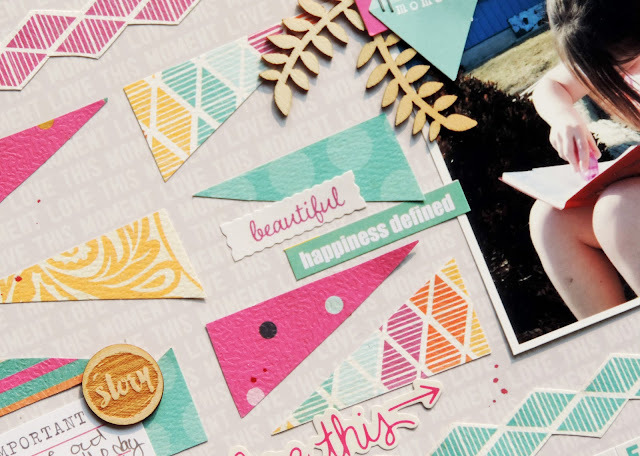 I layered embellishments across the triangle, to add some cohesion and to bring everything together. I hadn't' measured the spaces when placing my triangles, and with all the white space around them, they really needed something to ground them, and make everything flow together a little more. You can see this here, where I had elements going across and "uniting" several of the triangles. Thanks for stopping in today, take time to enjoy and create something you love! Really love this angled design and all those bits and pieces!